Michael Dyer has over $130,000 in live tournament earnings, including an eighth-place finish in a 2009 WSOP event for $65,905. After gaining most of his experience playing online, the Houston, Texas native wondered how he would fare if he returned to the Main Event. His sole appearance came in 2016, when he was eliminated on Day 1. "I haven't been playing live poker for a while," he said, "and I was curious to see how I'd do. The tournament has been going well so far." It certainly has. 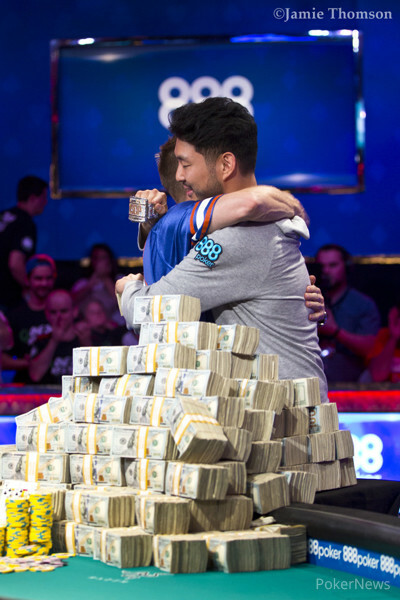 Dyer has been atop the chip counts since Day 5, when he finished with 12,180,000 to give him a wide lead over second place, the two-time bracelet winner Brian Yoon. When asked to reflect upon his massive chip lead during most of Day 7, Dyer said that playing a big stack simplified his decisions. "I got rolling when I won with a combo draw, the eight-nine of spades," he said. That pivotal pot came after a jack of spades, eight of diamonds, five of spades flop, when Dyer made a large reraise with his pair and flush draw and found himself against Paulo Goncalves’s off suit ace-jack. The king of clubs turn kept Goncalves ahead, but the ten of spades river gave Dyer a winning flush. As the final table loomed, Dyer moved to the Feature Table. During much of the action, he hunched in his seat; impassive and focused, with a box of Bite-Sized Shredded Wheat within arm’s reach. "You've gotta fuel up, somehow," he explained. Dyer's dad, David, also offered support from the rail. He flew from Houston to Las Vegas on the morning of Day 7, and Dyer's mom plans to join them for Day 8. "There's no pressure," he said, "but I was hoping to make the final table so my mom wouldn't fly out for no reason." On the Day 5 Feature Table, Dyer squared off against Cliff “JohnnyBax” Josephy, who raised to 110,000 under the gun with 3.8 million chips. Dyer three-bet to 315,000 with ace-king suited and Josephy, after some thought, four-bet to 815,000. Dyer shoved, barely covering Josephy's stack, and the former November Niner called with kings. The ten-six-three flop didn’t help Dyer, and neither did the turn five. But the river was an ace, which sent Josephy to the rail and boosted Dyer's stack to over nine million. 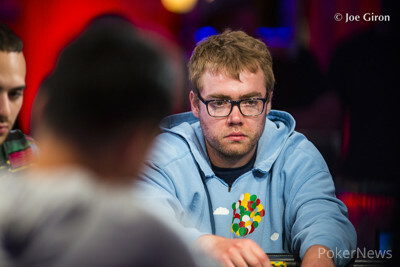 Throughout the Main Event, and especially in the later stages of the tournament, Dyer has shown a willingness to enter lots of pots and put pressure on his opponents through bold bluffs. Dyer's aggression and hefty 109,175,000 stack—only three million behind chip leader Nicolas Manion—should make him an exciting to watch player at the final table.